Anyway, by tradition -- family tradition I should say -- we usually eat ham for Thanksgiving. Most of us prefer ham to turkey except for my son. However, since we've been eating ham for the last few years, I thought I would make turkey this year. I didn't want a ton of turkey leftovers so I decided to make an oven roasted turkey breast, especially since that is the only part of the bird we (white meat lovers) prefer to eat. The turkey breasts come with the ribs attached and range from 5 to 8 lbs, about the size of a whole chicken. I went grocery shopping on Tuesday and had bought a 6 lb. turkey breast, still frozen. I stored it in the fridge when I got home so it would started defrosting and by Thursday, it had thawed completely. 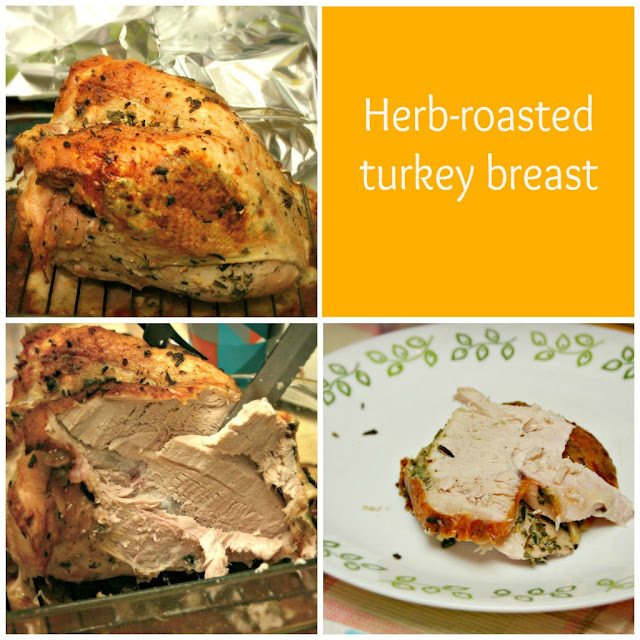 I used Ina Garten's herb roasted turkey breast recipe and it was totally delicious. The breast was moist and juicy and the fresh herbs and wine really gave it flavor. It took just two hours to cook up and prep was a breeze. Ina Garten's Herb-Roasted Turkey Breast recipe can be found here. 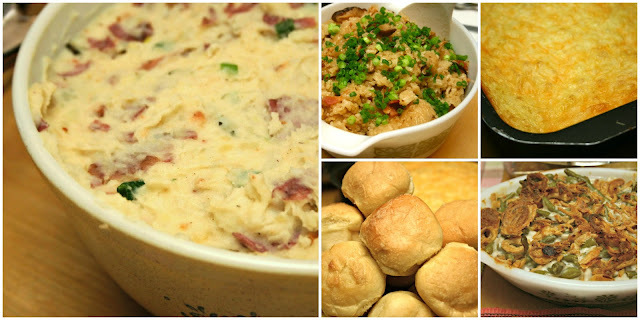 The trimmings: we had garlic basil mashed potatoes with bacon, Chinese sticky rice with shiitake mushrooms and more bacon, scalloped corn casserole, green bean casserole (my favorite) and soft garlic butter rolls. You may be wondering, where's the stuffing? That was replaced by the sticky rice. (We're rice eaters in this family.) We also forgot the cranberry sauce and the gravy (the horror!) but no one seemed to mind too much. Mr. VG requested for scalloped corn casserole because his grandmother used to make it for Thanksgiving when he was a child and after trying it myself, it will be a mainstay for every Thanksgiving from now on. Scalloped corn casserole is delish! We found the scalloped corn casserole recipe on Allrecipes.com and made it exactly as written. It came out perfectly -- cheesy, soft, sweet and savory at the same time. Divine. You can find the recipe here. 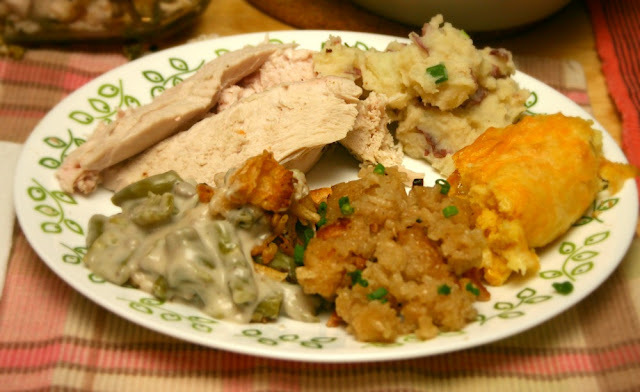 For the green bean casserole, I fall back on Campbell's classic green bean casserole recipe. Yes, it uses canned green beans instead of fresh ones and it's not the classiest recipe for green bean casserole out there but I love it and must have it every year. The recipe can be found here. Serves 6 or more as a side dish. Wash and chop the potatoes into large, uniform chunks. Bring a large pot of water to boil. Salt the water liberally then place the potatoes into it. Cook the potatoes for about 20 minutes or so, until softened. Pierce with a fork to test how softened they are. When they started to break apart, they're done. Drain them well then return the potatoes to the pot. Add the milk and butter and mash them well. Salt and pepper to taste. Fold the basil, garlic and bacon bits into the mashed potatoes and mix until distributed throughout. Serve immediately or keep warm in the oven. Mr. VG also made the garlic butter rolls and they are always a huge hit. 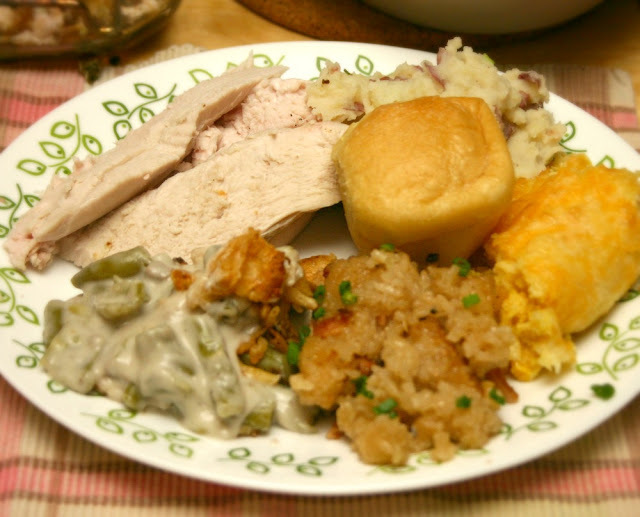 In fact, that is the only item that has no leftovers every year because the rolls are usually the first to go. He uses store bought Brown and Serve rolls which he bakes for 8 minutes, then brushes on melted butter that has been seasoned with garlic powder. He then returns the rolls to the oven and bakes them for another minute or two then serves them warm and puffy. They are totally delicious. And finally, the Chinese sticky rice. I made the sticky rice in my rice cooker so that at least part of the cooking process would be automated and it cooks up just fine that way. 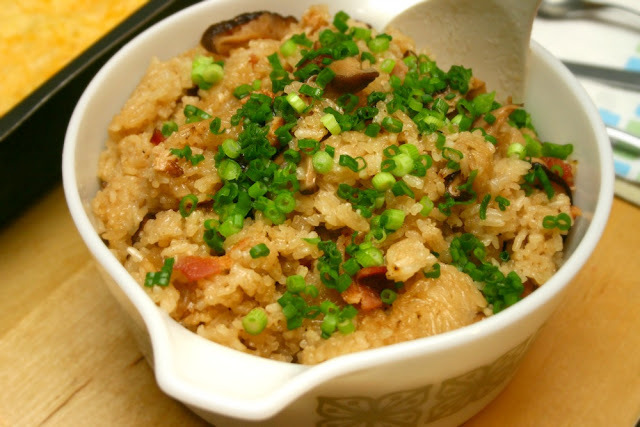 The rice does need to soak for an hour, mushrooms need to be reconstituted and the bacon has to be cooked to a crisp in advance so you'll need to factor in some prep time but after that, the rice cooker will do the rest. Heat the bacon fat in the rice cooker pot directly on the stove top. Add the minced garlic and saute until fragrant. Add the sliced mushrooms and saute for a couple of minutes. Add the drained sweet rice and continue to saute for another minute. Remove the rice cooker pot from the stove and place into the rice cooker. Add the wine, oyster sauce, sesame oil and chicken broth. Cook the rice on the normal white rice setting. When the Ready light comes on, open the lid and add the crumbled bacon. Stir the bacon into the rice to distribute. Garnish with chopped green onion before serving.